Freud referred to it as the death drive, others coined it “thanatos,” after the personification of Death in Greek mythology. Consider it whatever you want but there’s no point in denying mankind’s long-standing fascination with destruction. Everyone loves a good explosion. Striking directly into that primal high is the rising subgenre of physics-based games like Demolition Master where your primary goal is to strap dynamite to the structures and watch ’em fall. The novelty of Demolition Master and most physics-based games in general definitely lies in the many ways you can achieve your objective. Just like real-life, there are tons of ways to bring down a building and there is an unsettling sense of thrill and satisfaction in being able to experiment with explosive placement and seeing the extent of the damage it creates. Your possibilities are endless! Demolition Master also ups the challenge by requiring the resulting debris to fall under specified heights and occasionally also contained within certain areas. 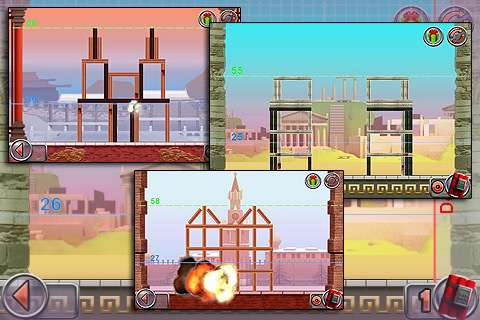 As addicting and enticing as it sounds, Demolition Master is hampered by a few aspects. While the explosions look and sound great, the structures themselves look very basic in design. At full view, the beams look crude and their thinness makes it difficult to place the dynamite exactly where you want to. You can zoom in by tapping the screen twice or by using the pinch/pull method and while it helps for more accurate explosive placement, the beams don’t look any better close-up than they do zoomed out. Like the graphics, the background music is also pretty hit-or-miss. The sound effects like the alarm and the explosions are really nice details and though its diverse soundtrack is a plus, it sometimes feels slightly ill-fitting. Another point of weakness is its lack of guidance. Though it’s not difficult to pick up, I didn’t feel like the control icons were intuitive enough for AppMania to just have their audience just jump in blindly and this minor point of frustration could easily be fixed with a simple in-game diagram or help guide. All-in-all, Demolition Master is a really solid, novel concept with great elements and an already fun gameplay that will appeal to many and keep them coming back for more. With some fine-tuning and a sturdy approach to its artistic direction and graphic design, Demolition Master could very well spearhead the new wave of strategic physics-based destruction. AppSafari review of Demolition Master was written by Aucoeur Ngo on March 2nd, 2010 and categorized under App Store, Fun, Games. Page viewed 3545 times, 2 so far today. Need help on using these apps? Please read the Help Page.